US #2821 from the Silent Screen Stars issue. Acting was something that he wanted to pursue. So, through his mother’s contacts, at the age of nine, Chaplin joined a clog-dancing troupe known as The Eight Lancashire Lads. Dancing never fulfilled his desire for acting though. 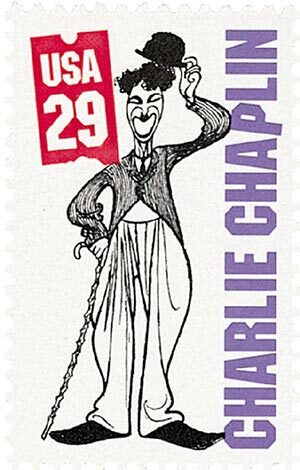 At nineteen, Chaplin toured Britain with the Fred Karno Company, and in 1910, he made his first trip to America with the troupe. In 1913, Mack Sennett, a producer in the new field of “flickers,” saw his act and offered Chaplin a part. At first, Chaplin was hesitant to leave the stage for films, but his mind was made up when he heard he could make $150 a week (about $15,600 in today’s wages). 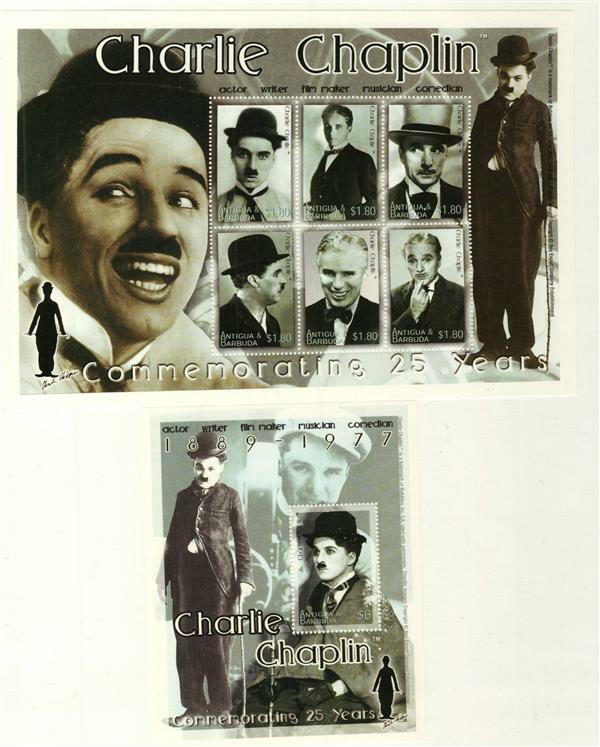 Antigua #2589-90 were issued for the 25th anniversary of Chaplin’s death. In 1914, Chaplin’s debut came in a short film called Making a Living. Wanting to stand out more as an actor, he then put together a costume of oversized pants, a tight coat, a derby hat, and a cane. His character, “The Tramp” was an instant success and became one of the most popular and easily recognizable figures of the twentieth century. Using his wild imagination he was able to transform dinner rolls into ballet shoes or a worn boot into a feast fit for a king. 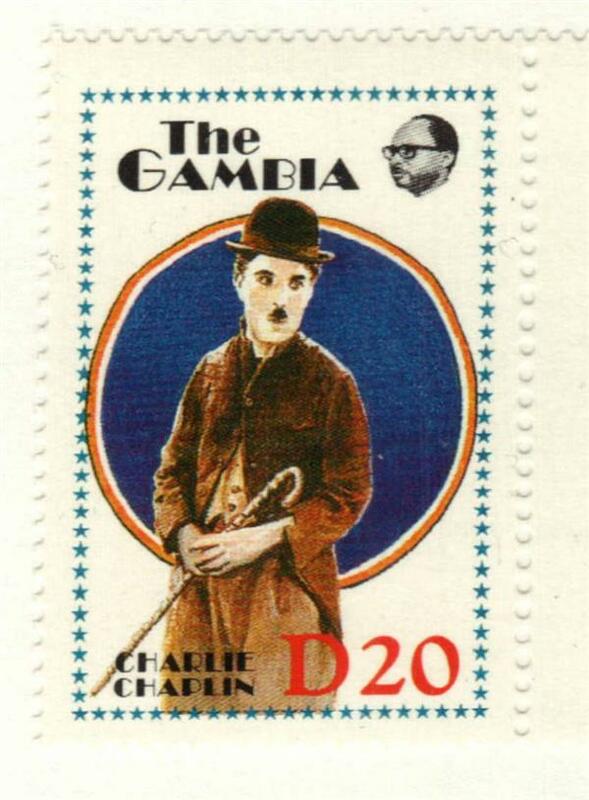 Gambia #775 pictures Chaplin as The Tramp. 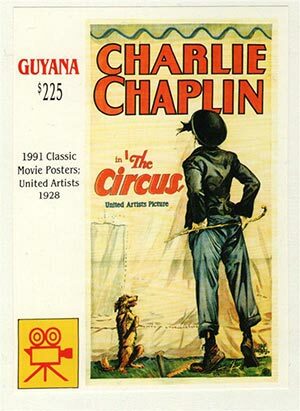 Guyana #2548 pictures the movie poster for The Circus. By 1919, Chaplin’s box office appeal was so great that no studio could afford to hire him. So he joined with actors Douglas Fairbanks, Mary Pickford, and D. W. Griffith to create United Artists, a distribution company. He could now have total control over the pictures he made. The first film he produced with the new company was A Woman of Paris. Though the critics praised it, audiences were disappointed that Chaplin didn’t appear in the film. The Tramp returned in the next movie titled, The Gold Rush. It was one of the highest-grossing silent films, making $5 million in profits. Grenada Grenadines #2123-25 pictures Chaplin and other actors from his era. When sound was added to films, Chaplin was hesitant to switch. He did incorporate music into his movies, composing many of the pieces himself. Eventually, the actor and director did make several “talkies” in the 1940s and ‘50s. Though he still worked mainly in comedy, Chaplin took on a more political tone. Films like Modern Times, The Dictator, and A King in New York highlighted social and economic issues brought about by the Great Depression, the rise of Hitler, and the Cold War. By then, his popularity had faded and his political views were controversial. He moved to Switzerland in 1953. Although he lived in the US for more than 40 years, Chaplin never became an American citizen. In 1971, Chaplin received an Academy Award for lifetime achievement in film, and in 1975, Queen Elizabeth knighted him. Over the course of his career, Charlie Chaplin made 82 films, most of them comedies, and most of which he directed. Chaplin’s movies enjoyed a resurgence in popularity later in his life before he died on December 25, 1977. 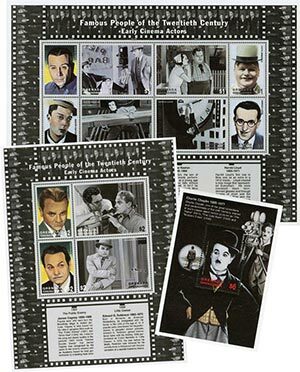 Six of Chaplin’s films are now preserved in the National Film Registry at the Library of Congress. 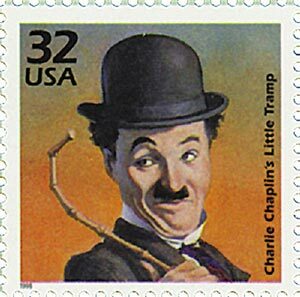 Click here to see a few popular Chaplin video clips. One Response to "This Day in History… April 16, 1889"
I remember watching some of his silent films when I was just a child in the 1950s.